Rotary Club of Elgin - welcome! Please scroll/swipe down through this page to find out more about us, in addition to the pages linked in the menu, top-left. May Gilchrist receives recognition for her incredible fund raising efforts. At present the club has 76 members and 2 Associate members. 3 Honorary Members, HRH Princess Royal, Grenville Johnston (Lord Lieutenant of Moray) and Frank Strang. 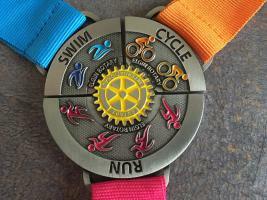 An extremely active club, Elgin is involved in most aspects of Rotary where Service and Fellowship apply. Weekly Meetings are held at the Eight Acres Hotel, in order to be flexible for our members we have different meeting times as below. From July 2018 the first Thursday in the month will be an evening meeting 5.30 for 6 p.m. finishing at 7 p.m. This will include service of a 2 course meal and business or speaker. Thursday Lunch meetings every week thereafter on Thursday 12.15 for 12:45pm finishing at 13:45pm. An informal evening meeting where Rotarians, Friends of Rotary and potential new members meet will take place on the third Wednesday each month 5.30 to 7 p.m. allowing members and visitors to drop in and out at times suitable to them. A Team Leader from one of our committees will give an update on club activities from 6 p.m.
See our calendar for details of all our meetings. Elgin Rotary welcomes new members and "Friends of Rotary". 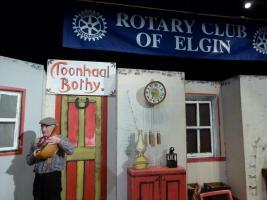 Visiting Rotarians will always find a warm welcome when visiting Elgin. Rotary International is the worlds largest service organisation for business and professional people, with some 1,243,000 members in 200 countried worldwide. Speakers : David Williams - Amazonian Medicine!